Janice DeAngelis is a Speech-Language Specialist and New Jersey Association of Speech and Language Specialists (NJASLS) Board Member. As NJEA members, we are involved in communicating with students and dealing with day-to-day school operations, activities, interactions with colleagues, support staff, caregivers, administration, fellow association members and much more. Students, of course, are also communicators. But for one in 12 children in the United States who are aged three through 17, communication is difficult due to speech and language-related disorders. About two to three out of every 1,000 children in the United States are born with a detectable level of hearing loss in one or both ears. When was the last time you stopped to think how you helped a student understand, remember, or express information? As an integral part of a school community, you are supporting communication. Your kind words help a student to understand. Your actions express a message to a student. Your direction and guidance encourage a student to remember. Communication is truly a complicated life process, difficult to simplify. No matter what form of communication—verbal, auditory, text, or body—numerous factors influence how information is being given and received. These factors may include aspects related to physical or language abilities, word or topic knowledge, mood or emotion, culture, or perception. Depending upon the strength or weakness of such factors, communication can either succeed or fail. Simply, communication can be described as a process of getting information from one place to another with meaning. Communication is an active process. Communication is continually happening, consciously or unconsciously. Even lack of communication is communicating. Our nonverbal or body language may communicate that we are listening, focused on something else, ignoring the other person, too shy to speak or many other things. Even after information is received, the information needs to be understood or decoded. Here again, numerous factors from the tone of our voices to hand movements will impact how information is given and received. We are in a 24-hour cycle of communication where actions speak and saying what is meant concisely imparts credibility and wisdom. 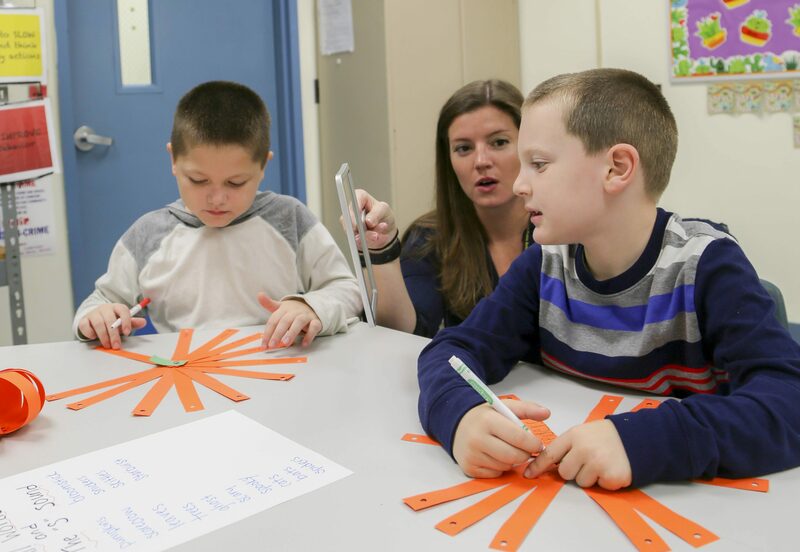 While every May is set aside as Better Hearing and Speech Month, all months of the year involve direct and indirect responsibilities of a Speech and Language Specialist (SLS) in schools. SLSs provide services to students, families, staff, and the community related to communication. The SLS will assess, analyze, and diagnose—often as part of a child study team—student communication competencies and characteristics. • Language and reading: understanding, expressing and organizing information, applying social, thinking, word formation, grammar and many other information components. • Articulation: producing sounds, syllables, words and conversation to be clearly understood. • Swallowing and feeding: use of mouth, throat and more while chewing and manipulating liquid or food. • Hearing: processing information and expressing or interpreting what is processed. • Voice: use of tone and volume for meaning. • Fluency: speaking, expressing, reading, or writing in a fluent manner or without stuttering. 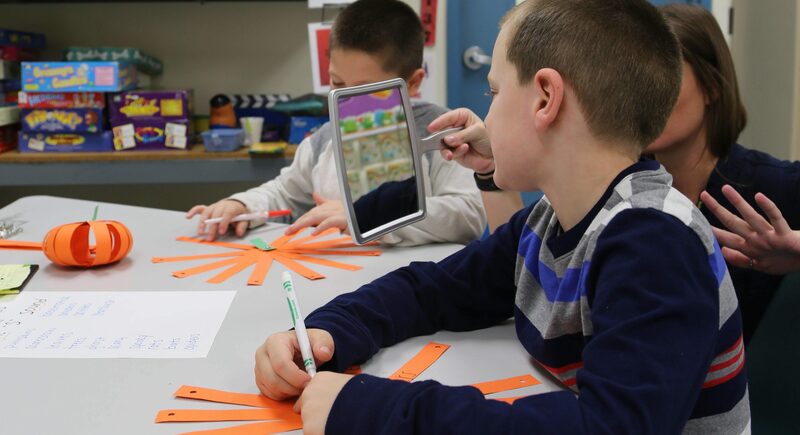 Jennifer Goldberg, a speech and language specialist (SLS) in Collingswood, uses a mirror to help a student to see the movements his mouth makes as he speaks. SLSs, like their fellow NJEA members, are involved with the daily school environment to include student learning, behavior, safety, growth objectives, legal mandates, paperwork, access to technology and more. The SLS works with preschool through high school aged students. These students may receive speech related services in conjunction with a classification and an individualized education program or to directly address difficulties other than language that impact educational learning. The SLS may serve on school committees that help to determine educational decisions for student instruction. Intervention through consulting, observing, or monitoring with data collection may assist students with communication deficits in the classroom. You can further support communication in many ways. Perhaps you would like to incorporate awareness with some activities for Better Hearing and Speech Month. Your NJEA Affiliate, The New Jersey Association of Speech and Language Specialists (NJASLS), can help to provide ideas, from discussing the definition of communication and creating a word collage or word clouds to coloring a themed flyer. You may email NJASLS at njasls@yahoo.com. In 1927, the American Speech-Language Hearing Association (ASHA) proclaimed the month of May as Better Hearing and Speech Month. The month is dedicated to raising awareness about communication disorders and promoting treatment that can improve the quality of life for those who experience problems with speaking, understanding, or hearing. This initiative aims to raise self-awareness about hearing and speech problems and encourages action for help. It encourages parents to identify possible speech and language problems with their children that can affect their learning and self-esteem. You should be proud to be a part of a school community that supports daily communication skills. Communication is a challenging life process and moreso for those who have communication difficulties. Getting information from one place to another with meaning involves you. It is continually happening consciously or unconsciously. As humans, our communication is unique and of great importance in a rapidly diverse and changing world. We are in a 24-hour cycle of communication where actions speak and saying what is meant concisely imparts credibility and wisdom. Being visible with how, what, when, and why you communicate inspires. In a world that is often hurried and lacking in personal connection, we must stop, look, and listen for effective communication for all. • Ask your Speech and Language Specialist questions or share concerns. • For resources, contact your NJEA Affiliate, the New Jersey Association of Speech and Language Specialistsnjasls@yahoo.com. • Know that you support communication for a student through your words, actions, directions, and guidance.